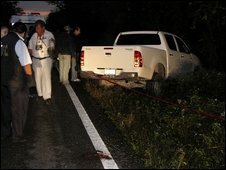 The three, who were found dead in the back of a truck, were part of a protection team for Cancun's mayor. The investigation is ongoing, but Cancun's local prosecutor has already said that the nature of the murders and the identity of the victims points to a contract killing by a drug cartel, the BBC's Stephen Gibbs reports from Mexico City. But most of the violence has been to date been concentrated in Mexico's Northern border cities.